Add one tablespoon of canola oil to the bottom of your pan. Sweat the chopped onions in the oil with a three-fingered pinch of salt and pepper. Add the beef and cook it, breaking it up as you do. Add another three-fingered pinch of salt and pepper, along with chopped garlic, and a tablespoon of fish sauce. Add the tomatoes and any fresh seasonings you may be using, bring to a simmer, then reduce the heat to low and cook for an hour. In a separate pot, cook the macaroni in boiling water till it’s half done. Drain the macaroni and add it to the tomatoes. Stir it into the sauce. When it’s cooled and the pasta has absorbed the tomato juices, transfer it to a large baking dish and cover it with foil. It can sit out for several hours like this, be refrigerated for up to two days, or frozen a few weeks. Bake it in a 400-degree oven for 45 minutes. 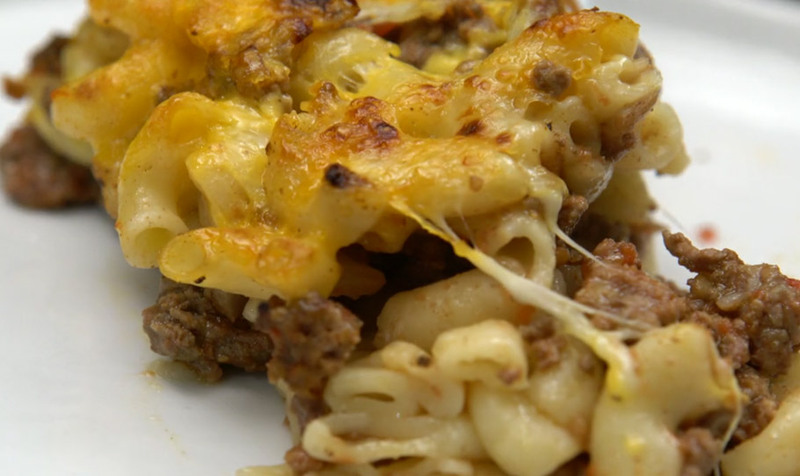 Just before you’re ready to eat, remove the foil, cover macaroni with the cheese and broil till it looks beautiful.